There are good scientists out there, many actually, but why is it that the ones who are so quick to stir up an attack against people are also the ones who just so happen to be media seekers themselves? Domeier has killed two white sharks that we know of and been accused of more. He's damaged countless others while having failed to increase protection for them. 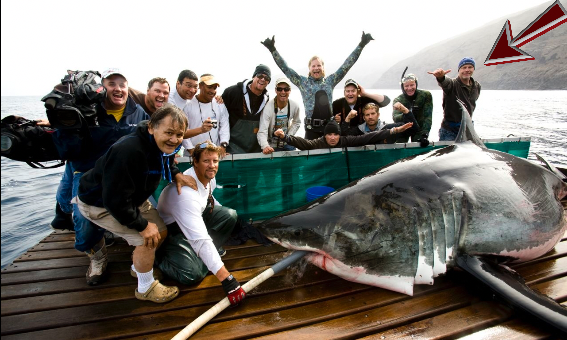 His asinine television appearances have earned him big paychecks while he accuses Juan and Ocean of exploiting sharks. Juan and Ocean have literally rescued two white sharks from mortal entanglement and not harmed ANY in their long history of shark diving. They've literally rejected Shark Week for offers to be in the same types of unethical shows Domeier appears in. Doc, showing us respect for sharks. Now just move a little to the left for the photo, we gotta get this shark back in the water in under an hour...I mean fifteen minutes. What's that? I earned 80K for this episode? OK, the shark can stay on the deck a while longer.